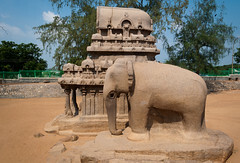 On the east coast of India situated about 60 KM from Chennai is the ancient city of Mahabalipuram. A UNESCO World Heritage Site this port city is home to many architectural gems. 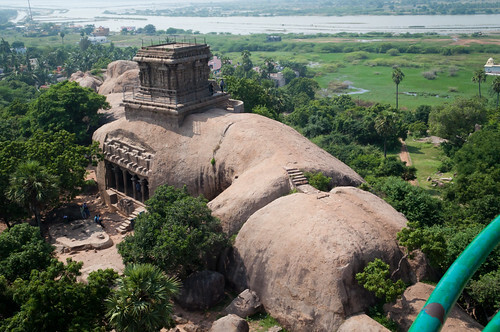 The city also know as Mamallapuram has its history dating back to the 3rd century CE perhaps even earlier. Though the city has all comforts of modern day living if one strolls down the lanes of the city and walks past some of the beautiful and well preserved buildings, one can, with a little imaginations be easily be transported to a time when the city was a thriving port city getting visitors from all over the world. There are many points of interests, the Pancha Rathas (Five chariots), Varaha Cave Temple, Thirukadalmallai temple, Arjuna's Penance, Shore Temple, Light House, Sculpture Museum and Tiger's Caves (located a stones throw away from the city). Most of the architecture is monolith and the deft details which can be seen in these sculptures and monuments is breath taking. What is even more amazing is these were all hand carved. The city is also home to many artisans who do a lot of sculpture work and is a good place to pick up great souvenir from the inexpensive thumb size sculptures to expensive 10 to 15 feet big statues. One can see these artisans working away a piece of stone and over time they slowly transform into beautiful work of art. Watching them work one can get a sense of the amount of work which would have gone into building the magnificent structure's which are found all over the city. The beach nearby is a good place to catch the sunrise but it has strong currents and is not recommended for swimming. 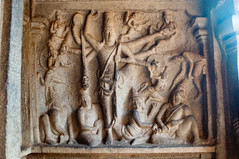 In addition to works of art which can be seen some of it buried under the Bay of Bengal. The city also was affected by the tsunami which hit the Indian hit the Indian coast line in 2005. However, this force of nature also revealed some structures which ave been lost to the sea. ASI has started excavating these new findings. Though one can see all the sights and sound of the city within a day it is recommended you stay a day or two to fully enjoy the city's beauty. If you are a photographer a few days more at this coastal town would be wonderful. Though doing this may make your pockets a bit lighter. There is an entry fee to almost every location and if you are a foreigner the costs are slightly higher. Nothing too major though. If you are a photographer getting to vantage points like the top of the light house are worth the minor charge. Though I must warn you that for some strange reason tripods are not allowed at these places. SLR and DSLR's are allowed. Some place there a minor charge for taking cameras inside. However, these cost do add up at the end of the day. On the bright side food is very reasonably priced. One place not to be missed is the Sculpture Museum. It does not get the coverage it deservers. There are over 3000 sculpture. They range from stone carvings to wooden works of art. A stroll to the backyard reveals many unfinished works. One can find works of art not just from India but all over the world. If you a person who is fascinated by history, architecture or wish to see artist convert a piece of stone to work of art this place is surly worth a visit. This is very nice information to us. I like this post . if do u want to know about What to See in India, Taj Mahal Tour Packages, taj mahal tour, Where to stay in India, Golden triangle tour and visit it. On the off chance that you are hoping to visit Vietnam and need a visa, you have to visit Green vietnam visa service. They will deal with you and give you the visa that you require.